Away Mode is a Rule type that lets you simulate being home when you are not. 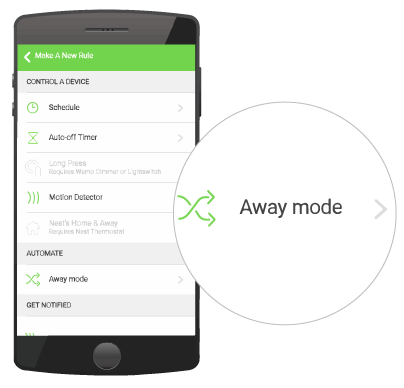 Away Mode will randomly turn ON and OFF Wemo® devices of your choice during a time period you selected. When a device is turned ON by the Rule, it will remain ON for a minimum of 30 minutes before turning OFF. 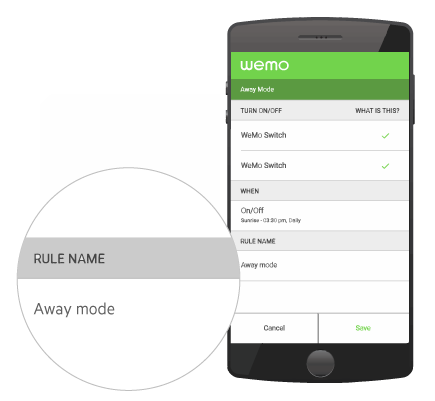 This article will guide you in creating an Away Mode Rule for your Wemo devices. 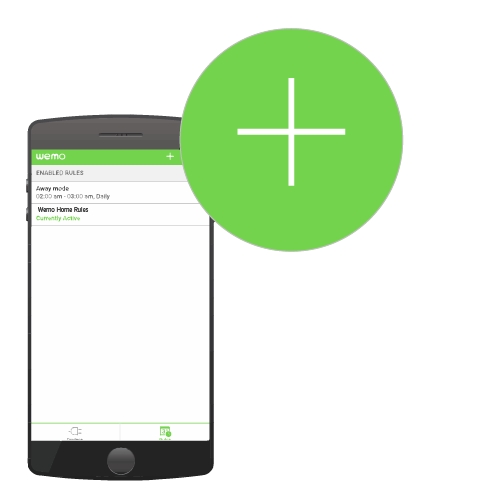 NOTE: Wemo App images may vary depending on the device (iOS or Android™) being used. Step 3: Tap the + button to create a Rule. Step 4: Select Away mode. 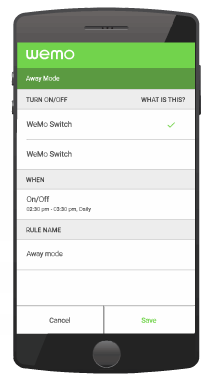 Step 5: Select which of your Wemo devices you want this Rule to control. The selected Wemo device is identified with a check mark. In this scenario, the WeMo Switch is used as an example. Step 6: Under WHEN, tap on On/Off to set the time for the Rule. - Choose the Clock icon to select a specific time. - Choose the Sun icon to set the Sunset and Sunrise of your area in control of the Rule. In the example below, the Rule will run from 02:30 pm until 09:30 pm. The days for this Rule is from Monday to Sunday. 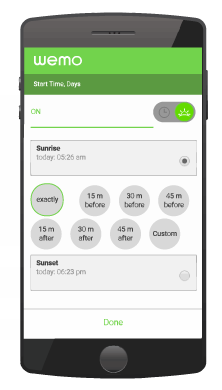 When using the Sunrise / Sunset option, you can choose to have the Rule trigger exactly at the Sunrise / Sunset or at a time before or after Sunrise / Sunset. In the example below, the exact time of Sunrise is chosen. Step 8: Under RULE NAME, tap Away mode and enter your preferred Rule name. Tap Save. Step 9: Tap Save to save the new Rule. NOTE: You can change a Rule anytime by selecting the Rule and tapping Edit. 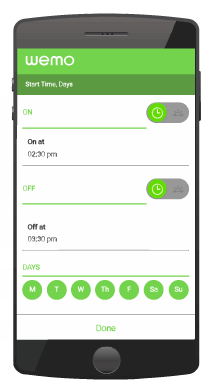 Manually turning OFF a Wemo device during the time the Away Mode Rule is running will disable the Rule for the rest of the day. 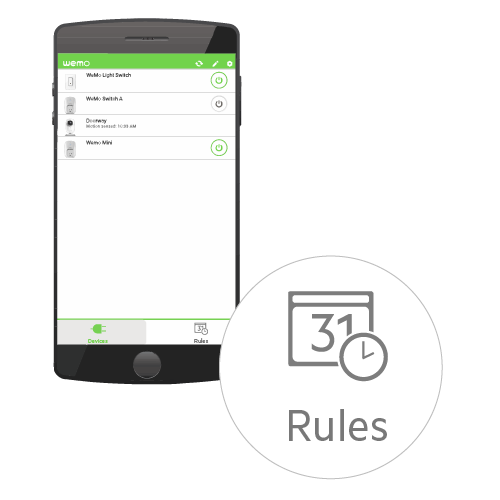 QUICK TIP: If you encounter issues such as the Wemo App doesn't work with the Away Mode Rule or creating a separate Away Mode Rule for each Wemo device doesn't work; resolve these by creating just one Away Mode Rule for multiple Wemo devices.